Before you spend hundreds of dollars on a piece of cardio equipment for your living room, take a look around. If you've got a set of stairs in your house (or nearby), you already have everything you need to get in shape. Not only are stairs ready-made for a killer cardio workout, but individual steps can be used for everything from lunges and step-ups to upper-body strength moves like push-ups and dips. Plus, it’s incredibly efficient: It only takes 30 minutes of stair climbing per week to reap cardiovascular benefits, according to a 2007 study published in the Journal of Sports Science and Medicine. You can burn more than 500 calories with 30 minutes of stair running, according to the American College of Sports Medicine (for a 150-pound woman). Even walking up stairs for a half hour burns 286 calories. That's approximately equivalent to walking at 3.5 mph for two hours! "Given how exhausting running a stairwell is, a blended circuit works best," says Fabio Comana, MA, MS, NASM, director of continuing education for the National Academy of Sports Medicine (NASM). Try this total-body strength and cardio workout that mixes stair running and walking with resistance exercises. For this routine, you’ll need medium-resistance exercise tubing (a resistance band will work) and a stairwell. After the brief warm-up, do each of the following exercises in a circuit (performing one immediately after another), taking minimal to no rest between each set. After the entire circuit has been completed, recover for one minute before repeating. Do the entire circuit three times total. Use rate of perceived exertion (RPE) to gauge your effort: Imagine a scale from zero to 10, with zero being no effort at all and 10 being the hardest you can possible work. Walk up and down the stairs for 3 to 5 minutes at an effort level between 3 and 4. Sprint up the stairs (8 to 9 RPE) and walk down. Repeat this pattern until 30 seconds is up. Stand at the base of the stairs and place your hands on the third step up (step should be at chest level) in a push-up position. Keep your back straight as you lower yourself towards the stairs and push back up. Perform 12-15 reps.
Anchor the exercise tubing by running it behind or around the stairway banister. Grasp the handles in each hand and step back far enough to feel resistance on the tubing. Pull the handles towards you in a row as you squeeze your shoulder blades down and together. Pause and return to starting position. Perform 12-15 reps. Stand in the center of the tubing, holding one handle in each hand. Bend your elbows (keeping them in contact with your body) as you bring the handles up towards your shoulders. Slowly return to starting position. Perform 12-15 reps. Sit on the second step and place your hands on the step behind you, palms facing away from you. Keep your feet flat on the landing, knees at a 45-degree angle, and lower your body until your upper arms are parallel to the step. Push back up, pressing your shoulders down away from your ears during the entire movement. Walk up and down the stairs for 3 minutes at a 6 to 7 RPE. Push your hips back and bend your knees to lower into a squat, driving your elbows back behind your torso as you lower. Press back up to standing and you extend your arms overhead. That’s one rep. Do as many reps as you can in 60 seconds. Do the same body-weight squats you did in the previous move, but instead of raising both arms overhead, reach one arm at a time, alternating arms on every rep. Continue for 60 seconds. Step your right foot forward on top of the first step and lower into a lunge, allowing your left knee to bend at a right angle behind you. As you lower, reach with both arms up over your right shoulder. Press through your right heel and use your glutes to return to standing. Repeat, this time stepping forward with your left foot and raising both arms over your left shoulder. Continue alternating legs until 60 seconds is up. Recover by walking around on level ground for 60 seconds. Repeat the entire cycle 2 more time, 3 times total, and then cool down by walking up and down stairs at a 3 to 4 RPE. 10-Minute Basic Program: Warm up by climbing up and down the staircase for 5 minutes at a moderate pace and then pick up the pace, moving faster and faster for the remaining 5 minutes. 30-Minute Steady-State Cardio: Walk up and down however many floors you can go up and down for 30 minutes. "Do this and you can do anything," says Merchant. 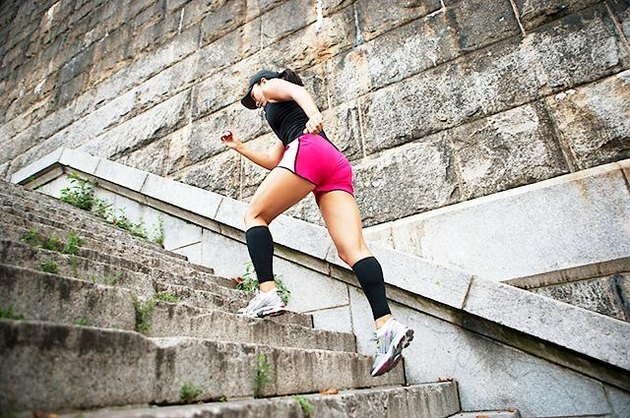 Does Running Up & Down Stairs Help Lose Belly Fat?